"Has anything traumatic ever happened to you? Describe the scenes surrounding the event." The "no" isn't because I have not experienced a traumatic event. Oh, quite the opposite. This prompt will help some reveal a piece of themselves that may need to reach other eyes...and hearts. But for me, picking which traumatic event to share will be like cutting myself open and bleeding all over the page. It isn't something I need to do and while I occasionally decide to strip away the facade and reveal my inner seriousness, I don't think today is that day. I have a sneaking suspicion that will never happen here. So, instead I had some more coffee and tried to tap into my giddy and whip up some humor...but then I checked Facebook and my humor leaked out my ears, displaced by angry steam. Have you read_The Handmaids Tale_? "It's just fiction, fantasy fiction at that?" "It could never happen here." And you would say that because we are a "Free" country. Then, you would read this: Mississippi's 'Personhood' law. And then you might say, "Well...we are free in every way but our wombs and reproductive rights, that is." So, if you tell me that a scenario like that which Margaret Atwood describes in_The Handmaid's Tale_ could never happen in such a 'Free' nation, then it is like trying to close the door on an intruder who is forcing his way inside to smother your control over your own body and your ability to choose what happens to it (a.k.a. Freedom). However much I dislike the phrase, "Never say Never"...well...never say never. What freedom shall we give up next? Oh, don't roll your eyes at me! Don't say that it can't happen here, that that sort of control can't take foothold...because it IS (trying to) and it has claws and is driven by a small band of ultra conservative religious extremist. Yes, I said it...extremist. And yes, I'm comparing them to the same extremist in the Middle East. That is how I see them and that is the kind of control I see them scrambling to take hold of. I love this country specifically for the ability to worship freely, or to not. The freedom to praise religion or denounce it. If a child wants to take a moment to pray at school, then doesn't it go against the idea of Freedom to deny them? And if a child chooses to not say, "...under God..." during the pledge, then again...aren't we talking about Freedom? But when it comes to a doctrine trying to impart its ideals, of which I am not in line with, on to my Freedom, then I draw the line. And don't EVEN try to tell me this country was founded on Christian ideals, because I'll have to come over there and pinch you...hard. I know better. Several of our founders were against the canoodling of church and state. They were of mixed faiths, and...in some cases, no 'faith'. Ours is a sordid, messy history and much more interesting when you don't stick to reading only the vanilla, candy coated revisionist versions. But all of those founding members worked damn hard to bring us the Freedom's we have now...and I'm not just talking about those colonial peeps...I'm talking throughout our short history right through to today. So, let me reiterate. I am not against religion. I am against 'people' who choose to wield their faith as a weapon against my Freedom and that of my daughter and her daughter and so on (and I believe this is a very small group with really big mouths). Whatever your feelings or religious beliefs are toward reproduction and birth control, then let that be your guide. Creating a LAW, that governs ALL people, including those that do not share your vision, and which takes away the freedom to choose what happens to our bodies away...is wrong. This whole post is based on conjecture - the far fetched notion that my live free or die America would ever sucumb to the horrid state of affairs depicted in_The Handmaid's Tale_. It's fiction for crying out loud, I know that! But this law being proposed by Mississippi has potential impact - and yes, again, it's just theory. But that old saying, "Never say never" floats around in my head again and it scares me. If you've spent any time reading the news, or listening to our poor excuses for Presidential candidates (this should REALLY scare you), then you might start seeing little bits of our freedom being quietly escorted to an undisclosed location...for our own good?? Hmmm...no, I think I'll stay vigilant and fight for the Freedom to choose what happens to and with my body, thankyouverymuch. And one other thing: I also wonder what sort of boon our struggling economy would see if our leaders would focus more on caring for those of us that are already out of the womb, you know...like jobs and better educational systems...that sort of stuff. Ya, I'd really like to straighten out this world a bit before we start ensuring that as many babies are born into this mess as possible. And finally, this is merely my opinion and an admittedly realativly uninformed one - but, that doesn't stop the politicians from spewing their own rhetoric, so why should it stop me. I am also not trying to open a debate on religion, ethics, rights, etc. I value, so very much, the right of everyone to say their peace, to be who they are, to love whom they want (consentually and as adults) and to live freely by their own moral compass (whether through faith or an internal guide) - and that it is a compass of compassion and goodwill. So please keep that in mind if you choose to comment here. Ok...I'm climbing down from my soap box now and slapping a piece of duct tape over my mouth (or...around my typing fingers??). And this is why I still think I should become president. Even though I sit way over on the right, I agree with you on a whole heap of things. Mainly that the Government needs to stay out, and let us think for our selves. It is not up to men in suits to decide what is best for us, our bodies, our lives... it's up to US to develop our own morals, standards and thoughts. I might have my feet firmly cemented where I stand and nothing can move me from those positions, but I'm not God and I have no, and want no control over the lives of others. This whole Mississippi crap makes me boil on the inside. Let's say they outlaw birth control, what are they going to do with all of the babies being born to women and families who can not afford them or even worse do not want them. That and any person with half a working brains knows that "the pill" doesn't harm an unborn or human life. It prevents the female body from being able to get pregnant. I'm getting myself all worked up again over the stupid of some people in this country that were put in a place of power. Worlds like the one described in The Handmaid's Tale or Orwell's 1984 don't just one day magically happen. They are made through the passages of little laws here and there - changes that may seem innocuous or in the "best interest" of the common people. Take, for instance, the Antoine Jones case currently being reviewed by the US Supreme Court. If the court decides that law enforcement can use GPS devices to track suspected criminals without a warrant and without probable cause, that's another healthy swatch of our rights dying in order to "protect us", I guess, from ourselves. As for Mississippi's failed (YES!) attempt at getting their personhood law on the books...Colorado has, twice now, handily defeated similar bills. We haven't seen the last of these bills around the US, of this I am certain. Please don't ever stop caring about our freedom. Great post-- thanks for speaking out in a voice of reason. Incredible post, Melissa. 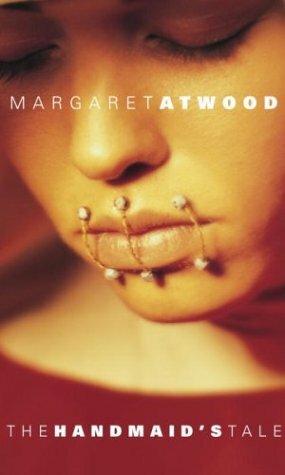 The Handmaid's Tail is required reading in most Canadian highschool and/or university English classes because Margaret Atwood is one of ours. Unless of course, you're in a conservative small town where books like this one, and movies like Malcolm X are denied students because it's "unChristian" to discuss these topics. Get up on that soapbox, lady. It's the only way we can make it better. Thank you EVERYONE for your comments! Such a touchy subject is hard to predict how people will take it. Of course, as always, the comments are far better than the post itself! Thanks again!